Collectors, experts and connoisseurs of fine watches know the true value of a watch that has a guarantee. For many people, it is of such importance that purchasing the full package, known as the “box & papers”, is vital when buying a timepiece. The guarantee is a significant document because it ensures the authenticity of a timepiece (thus increasing its investment value), whilst also offering essential information about a watch’s previous owner history, particularly in the case of a vintage or antique watch. The most important watch brands (Rolex, Patek Philippe, Franck Muller, the group Richemont, Swatch Group, Corum, Eberhard & Co., Tag Heuer, Tudor, Zenith, Chronoswiss, Breitling, Hublot, Alain Silberstein, Universal Genève), contribute to increasing the value of guarantees by enforcing and manufacturing attractive and detailed certificates for its watches. For some, they have become so desirable that they have reached cult status. The guarantee of a Rolex watch deserves its own section, in particular, how it has developed and been modified over the years. Although the very first guarantees issued by the Rolex crown are not easy to find, it is possible to reconstruct an example of the certificate, useful for both understanding the historical importance and the evolution of the guarantee over the years. One of the first Rolex watches to be provided with a guarantee dates back to 1934 and was issued by the “Official Controlment Office for the Rating of Watches”, founded in Bienne, La Chaux-de-fonds, Le Locle and St-Imier in Switzerland. The document records the movement number, model (in this case, Prince Impérial) and some technical characteristics of the watch. At the bottom of the document, there is the stamp mark of Contrôle Officiel de la Marche des Montres, and, to the right, the date and manager’s signature. The back of the guarantee shows the Swiss regulations followed to test the watch’s quality and precision. For some watches, it even provides the additional note: “Especially good time results”. The next example of a Rolex guarantee dates back to 8th July 1943, from Lot 311 (reference 3525) known as the “Monoblock Rolex”. This watch has a special history linking it to its owner, Corporal Clive James Nutting. Whilst he was imprisoned in the German maximum-security prison, Stalag Luft III, Nutting was given the watch by another soldier, (who hoped for its return after the war). The watch is supplied with an original receipt, which includes the model reference number, case number, the original guarantee, and items of correspondence between Corporal Nutting and the Rolex founding father, Hans Wilsdorf. The 1943 watch certificate also records the watch case number and guarantees its technical perfection for all components. In the 1950s, Rolex issued guarantees in the form of a large format multi-paged booklet. The guarantee itself occupied the central part of the book, where, in the space provided, the owner had to fill in the serial number of the watch. The remaining pages detailed the main technical characteristics of the product (eg. the water-resistant Oyster case) and instructions for the correct use of the watch (for example, how to set the time and date). The final page was for the official dealer’s stamp. A few years later, the guarantee was offered in a new, slightly smaller format. The first pages contained the “red seal”, which certified the precision of the Rolex mechanism, and a brief history of the company. The central page contained the serial number of the watch and the final pages, instructions and records of the parent company. At the end of the 1950s, the size of the Rolex guarantee was reduced to a single sheet of paper folded into three parts, with the certificate of originality on the first page. Instructions were still included, together with the history of the brand and, in addition, a list of the most important Rolex watch dealers. This style was used until the beginning of the following decade. At the beginning of the 1960s, the format of the Rolex guarantee returned to a booklet, but kept the features of the 1950s guarantee. Rolex also embossed the serial number rather than writing it in ink. This became a standard in the years to follow, with the exception of certain guarantees printed in the U.S that still show the number written in ink. In the middle of the 1960s, Rolex included a new booklet, “Your Rolex Oyster”, translated into the language of the relevant country. With a white cover, this booklet included the brand history, instructions and also, the technical innovations of the manufacturer. The guarantee could be found at the centre of the booklet, with the embossed brand identification number. Towards the end of the 1960s, Rolex once again introduced a guarantee whose serial number had to be completed by hand on the last page, next to the official retailer’s stamp. This model was used until the beginning of the 1970s. The Rolex models, Submariner Ref. 5513 and Cosmograph Daytona, are exceptions. These watches are not provided with a chronometer certificate and the guarantees have to be completed by hand. All other COSC certified Rolex watches show the standard embossed guarantee. 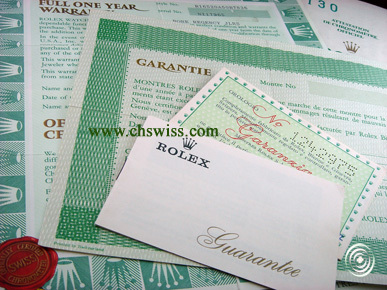 During the 1970s, the Rolex guarantee was a single sheet of paper folded inside a wallet with the COSC chronometer certificate (“the red seal”) on the bottom right side of the guarantee. The serial number was embossed and accompanied by the dealer’s stamp and the date of purchase. The guarantee sometimes included a protective sticker, removed at the time of purchase. This model of guarantee was used, without any major changes, until the 1990s. The key change for these decades was the “country code”, a three digit number, located next to the serial number, that Rolex used to identify the nation where the watch was sold. The only exception is the 119 code, reserved for watches provided by COMEX, a French company, specialising in scuba immersion. In June 2001, at the beginning of the new millennium, Rolex introduced a guarantee with a hologram (of coloured diamonds) for security. Also, for the first time, it specified the material from which the watch was made. Using this type of guarantee, the Swiss company tried to increase its resistance to the counterfeiting of its watches, thus maintaining the authenticity of its products. The most recent guarantee, released at the end of 2007, is presented in the format of a credit card, stating the watch’s serial number, model reference number and purchase date. This guarantee card also contains a blank space for the Rolex dealer to write in the name of the purchaser. Amongst the extensive list of brands with official guarantees is Patek Philippe, the historical Swiss watchmaker that has always taken great pride in the quality of its watches. Each watch is supplied with a Certificate of Origin, that acts as a type of “birth certificate” for the timepiece and includes all relevant technical details. 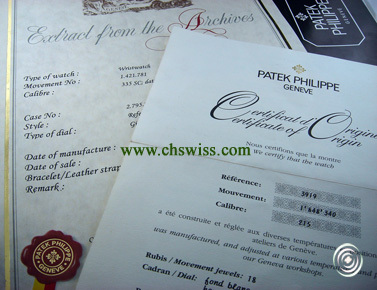 It serves as a guarantee by certifying that the watch is registered with the Patek Phillippe archives. The Richemont Group, which includes some of the most famous watch brands, has always taken great care of the documentation that accompanies its watches. All the brands (be it Cartier, Jaeger-LeCoultre, Piaget, IWC, Vacheron Constantin, A. Lange & Söhne, Baume & Mercier, Officine Panerai) demonstrate this by means of specific supplementary services the manufacturers have offered. For example, Vacheron Constantin provides a service that verifies the authenticity of the watch and its components, as well as giving a technical description of the watch and stating its year of manufacture. This certificate of authenticity can only be issued after examination by Vacheron Constantin experts. The company is also able to provide the customer with an insurance certificate for the watch, if requested. This document is used exclusively for insurance purposes and shows the price of the watch model from its most current catalogue, if the model is still on the market. If it is no longer available, the price is taken from a Swiss publication dating back to when the watch was last produced. To obtain this document, it is not necessary for the watch to be examined in Geneva; supplying the serial and movement numbers of the watch suffices. With the exception of a few brands that remain loyal to the paper format (for example, Patek Philippe, Jaeger-LeCoultre), most companies supply their watches with a card format guarantee. IWC and Officine Panerai are just two examples of brands that use the card guarantee. Swatch, a leader in the production and sale of watches, understands the importance and value of the watch guarantees it provides. Amongst the brands that belong to the Swatch Group are Breguet, Blancpain, Omega, Longines and Glashütte. Omega, the official Swiss chronometer manufacturing company for the Olympics since 1932, supplies its watches with a card format guarantee. In addition to this, it provides an information service for its vintage watches. This information can be requested by completing a downloadable form from the official Omega website. Amongst the other most prestigious manufacturers, Audemars Piguet deserves to be mentioned. Established in 1875, the company rigorously maintains its products’ authenticity by its guarantees. This Swiss company integrates its guarantee booklet, (known as a certificate of authenticity), with its certificate of origin, and issues them through authorised Audemars Piguet retailers. The guarantee booklet, known as the “Guarantee and Certificate of Authenticity”, must be completed by the retailer at the time of purchase. The certificate will only be considered valid if it shows the case number of the watch (found on the dial) and contains the dealer’s stamp, signature, and date of purchase. Finally, we should mention some individuals who contribute to the world of watch guarantees; watch architect, Alain Silberstein, who provides a Certificate of Authenticity on request, and Franck Muller, “Master of Complications”, who supplies his merchandise with a leather-bound guarantee and certificate of origin. Apart from the certificate of guarantee, prestigious watch-making companies always strive to provide another type of guarantee for their customers. This is the guarantee of continuing expert assistance for their watches, making the customer feel more confident with their purchase. This type of guarantee comes from trust formed over many years when a company relentlessly pursues the virtues of excellence and reliability; elements that make a brand memorable.